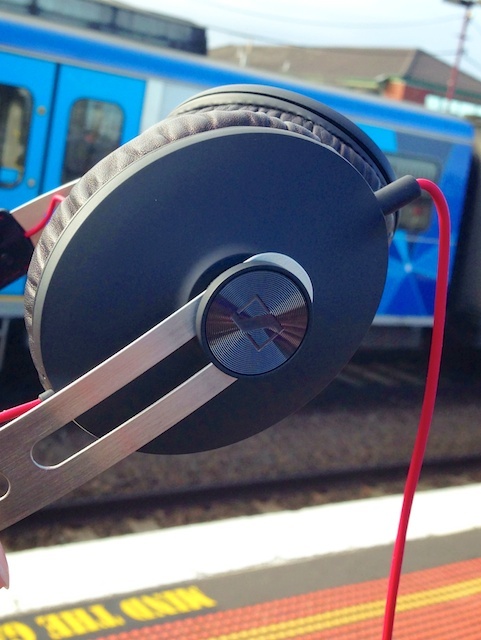 Lowdown: Headphones for the practical portable audiophile. I cannot stress the point enough, so I will start off with a bold statement: the only reason why I could have been the audiophile I have been during my twenties was my general lack of a life elsewhere. This is not the place to discuss the social life I had back then; the relevant point is that the situation allowed me to listen to music critically and often. Whereas normal people did normal people’s stuff with their spare time, my favorite pastime revolved around dimming the lights to enjoy high fidelity reproduced music delivered at high volumes. With great powers come great responsibilities, and with time I found my dedicated music listening activities to be much more than endangered; they were extinct. It's one of life's sadder jokes, actually: by the time I could afford a decent hi-fi I could no longer afford to spend the time and use it properly. Technology stepped in to fill the gap with the introduction of portable music players. Obviously, there's nothing new under the sun in the sense we had this portable music ability since Sony came out with its first Walkman. The key difference is that lately we found ourselves able to carry audiophile grade quality recordings on us; the question turned into how we are to make the most of this newly found ability. The purist audiophile had her answers to this question for several years now. Step 1: Get your iPod, fill it up with uncompressed music, use a headphone amplifier, and put audiophile grade headphones atop your ears. Step 2: Avoid moving much.The more practical amongst us had to compromise, though, usually on quality. Recently, Sennheiser knocked on our door with a bold statement: we can be practical without compromising sound quality. We can use Sennheiser Momentum headphones. I tried the Momentum on numerous occasions before I actually bought them. Many shops will allow you to plug in your smartphone to their array of headphones for testing. Me, time and time again I could not avoid noting how the Momentums stand above the rest. Sure, they are overtaken by the likes of Sennheiser's own HD 600 or HD 650, not to mention various exotic headphones from several either makers. None, however, can compete with the Momentum in the sound quality delivery for a practical, portable setup. None will offer a package I can use at my office desk, walk the street with, even run to catch a train with, not to mention sit on a noisy train with. And none sound so good driven solely by my iPhone. I actually find it hard to distinguish between the sound quality offered by iPhone driven Momentums and that offered by the HD 600 driven through a proper amp. The main difference is in the headphones' design: the former are of a sealed design, which helps in noisy public places, while the latter are of the open design that is generally less prone to distortion by virtue of the fact it doesn't have to contend with a sealed environment. Yet it seems that with the Momentums, Sennheiser managed to break a threshold and provide us with headphones that will not only sound great powered straight through a smartphone, but will also sound great under portable applications. When I say they sound great, I mean it. Bass is tight, and the sound stage is not only precise to the point of me being able to tell exactly what each instrument is doing, its staging is all but perfect. The level of resolution resolved by these headphones is unsurpassed, never mind the headphones' specialization in mobile use. Tracks like Pink Floyd's Time reveal layers I wasn't aware of despite this being the album I listened to the most, ever. Led Zeppelin's arrangements, and the brilliance of Jimmy Page, shine like never before in the acoustic version of Kashmir. And when I get to proper audiophile recordings, like Robert Lucas' Completely Blue from Audioquest, I am in audio nirvana: this one is a faultless presentation. Music not only seems to reside between my ears, it's also outside my head. The experience is actually fairly similar to that of my hi-fi, quality wise, only that it's delivered in a very portable package. Listening to tracks heavy on out of phase sounds, I often find myself looking over my shoulder to identify where that sound is coming from; Surely a better compliment to these headphones cannot be found. Sure, they have a tiny bit of what passes for "headphone sound"; but then again, so do much better audiophile grade headphones that do not need to content with being highly mobile. I would sum up the Sennheiser Momentum sound description by stating they offer a neutral presentation of the recorded sound, and a highly loyal one at such. Fidelity is the main criteria here, not inflated bass that competing headphones try to attract the average punter with. Thus finally, after all these years, I am able to recreate those moments of musical magic I had on my own with my hi-fi all those years ago. I may be doing it while working; I may be doing it while still half asleep on my morning train ride to work. It doesn't matter, the magic is there. At the risk of repeating myself: I am unable to find headphones that deliver as well as the Sennheiser Momentum headphones for practical portable usage, period. Obviously, the Momentums are not perfect. First there is the matter of price: most reputable shops sell them for $400. That is not a sum most people can afford to spend, especially when - as is always the case with audiphilia - many of them will claim not to be able to hear the difference in the first place. It sure seems as if the Momentums are priced and packaged to act as some sort of a status statement! I have to be petty and add there is more to these headphones' price than their original price tag: with quality so good I could easily tell the less compressed tracks from the more compressed track, I find myself testing the limits of my mobile monthly plan more than I did before. It also calls for higher storage smartphones, which - in the case of the iPhone - can be quite an expensive affair. The next issue is a more minor one, to do with fit. The design of the Momentum headphones relies on a tight arc to keep the headphones pressed against the listener's ears. There are two problems there: because of the shape, there is a difference between the pressure level at the top of the ear and the level at the bottom. Then there is the matter of the pressure, coupled with the sealed design, acting as an ear warmer. Thus far I'm enjoying the effect in Melbourne's winter, but I suspect that come summer there will be sweat to add to the equation and then the discomfort that comes with that. Regardless, after two hours with the Momentums, if not earlier, you would probably seek a break. 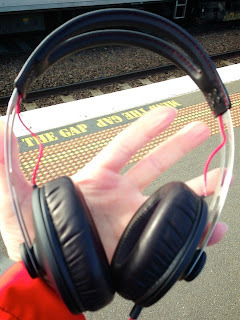 I read several reviews claiming the Momentum suffer from potential fit issues with big eared listeners. My impression is that while the Momentum's caps are smaller than some other headphones around, they are still fine around the ears. Given the size of my ears - I seriously doubt your ears would be bigger than mine - I do not see any problems there. I will also note the Momentums fit my large head quite well, a feat that should not be taken for granted (my wife's AKG K450 headphones, for example, fail to cover both my ears). I do wonder how long the stress based mechanism for controlling the headphone's caps height would last, though. Surely things would loosen up over time? 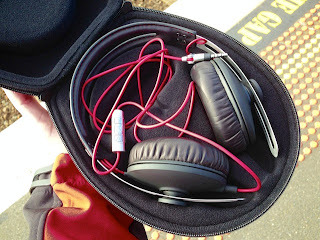 Where I do see significant fit problems is with the carry case supplied by Sennheiser. It is huge! It seems as if Sennheiser went out of its way to come up with something bombastic, to "enhance" the headphones inherent lack of foldability. As it is, that carry bag fills about half the storage space in the rucksack I carry with me to work. There is an inherent contradiction at hand here: on one hand we are offered extra portable headphones, while on the other we are meant to carry those extra portable headphones in a bag the size of a semitrailer. It is as if someone at Sennheiser had a hard time offering such a well targeted product to the public, so they've decided to screw it up a bit. Well, at least they didn't screw the sound quality up. Since I bought the Sennheiser Momentum headphones I find any piece of music I listen to to be a celebration. It is as if I'm listening to new songs altogether, even though I have been spending my time revisiting my most favorite pieces. In that, the Momentums stand apart from the rest; they stand on their own when considering they do so in a highly portable package. Sennheiser have themselves a winner here. It's a pity it's such an expensive winner, and it's a pity it still requires the odd compromise here and there. Subjectively, I'm giving them 5 stars; objectively, though, I will grant them "only" 4 out of 5 stars. I suspect most audiophiles will reside somewhere along this continuum. Note: Sennheiser recently started selling headphones called "Momentum on Ear". While these are similar in physical design to the Momentum headphones discussed here, they are not of comparable quality. My impression, following limited listening at a very noise environment (PAX Aus), is that they are nice but lack some of the main qualities that render the Momentums an audiophile's delight.